What’s next in the legal fight over Trump’s travel ban? SAN FRANCISCO — Another appeals court, another defeat for the Trump administration. The San Francisco-based 9th U.S. Circuit Court of Appeals on Monday refused to reinstate President Donald Trump’s executive order banning travelers from six mostly Muslim countries. A three-judge panel said the administration failed to show that blocking citizens from Iran, Libya, Somalia, Sudan, Syria and Yemen was needed to protect the U.S. The court also found that the president’s order ran afoul of an immigration law that prohibits discrimination on the basis of nationality. Another federal appeals court, the Virginia-based 4th Circuit, last month also refused to reinstate the travel ban, a decision Trump has already appealed to the Supreme Court. Here’s a look at how the rulings compare and what might come next. 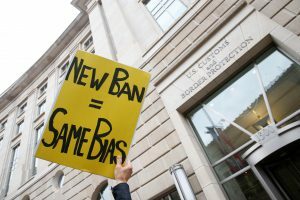 Critics of the ban have asserted that the president’s order was motivated by anti-Muslim sentiment, in violation of the Constitution’s separation of church and state. The 4th Circuit’s ruling took that question head-on, agreeing that the ban officially disfavored Islam — as evidenced by Trump’s campaign statements calling for a “total and complete shutdown” on Muslims entering the U.S. — and was thus unconstitutional. But the 9th Circuit sidestepped that question, saying they didn’t need to answer it because the legality of the travel ban could be decided on narrower grounds: It violated immigration law. “National security is not a ‘talismanic incantation’ that, once invoked, can support any and all exercise of executive power,” the judges wrote. By avoiding the question of Trump’s motive for banning the travelers, the 9th Circuit avoided a thorny issue about whether courts should consider the president’s campaign-trail statements. The 9th Circuit, however, did not completely ignore the president’s statements. The judges pointed to a June 5 tweet by Trump saying the executive order was aimed at “dangerous countries.” That helped demonstrate that he was not assessing whether the roughly 180 million citizens of the six countries had ties to terrorism, they said. In addition to banning travelers from six mostly Muslim nations for 90 days, Trump’s executive order called for a suspension of the nation’s refugee program. In his March ruling striking down the travel ban, a federal judge in Hawaii also held that the suspension of the refugee program was unconstitutional. The 9th Circuit rebuffed the administration’s efforts to reinstate that part of the order as well. The court said the president was required to consult with Congress in setting the number of refugees that would be allowed into the country in a given year and could not decrease that number mid-year. That issue wasn’t before the 4th Circuit, because in the Maryland case it considered, the lower court judge had not struck down the refugee program’s suspension. Attorney General Jeff Sessions said after Monday’s ruling that the ban was necessary to protect national security, and the president was within his lawful authority to enact it. The 9th Circuit’s more narrow focus on immigration law may appeal to conservative justices on the Supreme Court who might be loath to extend their review beyond the text of the executive order to include the president’s campaign statements about a Muslim ban, said David Levine, a professor at the University of California, Hastings College of the Law.